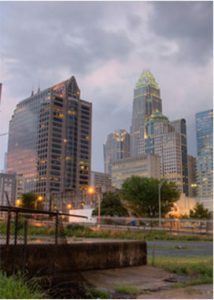 Rapid growth in the Durham and Triangle area is expected to accelerate the need for government to seize property through eminent domain for public use. Owners of commercial, residential and farmland in the path of this growth face the prospect of government takeover of their lands to make way for such public projects as highways, roads, sewers, parks and lakes. Landowners need experienced counsel to ensure they get just and fair compensation for their property. The government is interested in paying the lowest possible price for the land it acquires through eminent domain. The eminent domain attorneys at Thomas, Ferguson & Mullins in Durham have extensive experience in land condemnation litigation. They have successfully represented clients on both sides of the issue — landowners and government entities. This experience gives them thorough, intimate knowledge of the law and the issues involved. Attorneys carefully evaluate each case with the help of real estate appraisers and other experts to determine what is fair compensation for an individual’s land. Often the value of the land is substantially more than the government offers. They negotiate with the government on behalf of these landowners or fight in court, if necessary, to ensure they receive full and fair compensation for their property. If your property is going to be seized through eminent domain, feel free to contact our eminent domain lawyers to discuss your rights and legal options. Is your property going to be seized against your wishes through eminent domain? Not if we can help it!